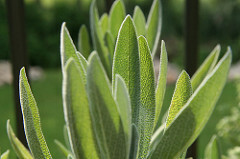 Chop sage leaves and mix them with beaten eggs. Heat olive oil in a medium size frying pan. When hot add the egg mixture. Spread it out into the shape of an omelette as thick as possible. Remove from heat and sprinkle with sugar. Serve hot. sauce blanco, Leon palera, L. Salix atrocinerea, Fr. saule, Eng. common willow. This tree or bush is native to northern temperate areas and grows in humid areas or in marshlands. Its nectar flowers bloom in Spain from March through April. 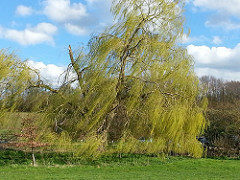 By the 14th C, the predecessor of what is known as the willow, today, existed only on riverbanks in Europe. It was appreciated for its decorative effect and medicinal properties. The bark is extracted and used to reduce fever. like today’s aspirin. Further, it was used to relieve rheumatism although today’s modern medicines are more effective. Still it is used as a sedative and administered in tonic form, by either letting the bark sit in water for half a day and then boiling it or marinating it. This is well chopped or ground into powder in wine and imbibed three times a day. Dioscorides recommended the leaves, bark and sap as astringents. For iliac pains, he prescribed drinking the leaves ground with pepper and mixed with wine. He thought that drinking the seeds in a liquid would loosen the blood in the chest. The ashes of the bark were mixed with vinegar to make an ointment and applied warts and corns to make them disappear. For earaches, he recommended placing the bark and leaves in the rind of a pomegranate with pink oil and boiling it. Further, he claimed that the sap improved eyesight. 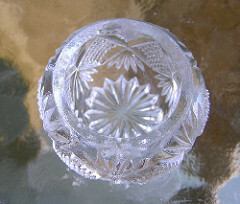 MEng nef, Eng saltcellar. When salt was scarce, only high nobility could afford it. From this came the expression “above the salt” as it was only served to the upper tables in the hall that were set on a platform. Lords in England had huge saltcellars, usually in the shape of boats. They were placed on the table in front of them in the hall for banquets, to symbolize the extent of their hospitality as salt was necessary for life and its vital role in preservation. The size of the saltcellar symbolized the status of the lord. Those of high status had the biggest saltcellars and were more hospitable than those of lower ranks. Spaniards had such big saltcellars that some had wheels. In Spain salt was offered to all the guests. If there were many, bread was hollowed out and used as a saltcellar at the lower tables. Ar. mirkas, kroush mahshiei (stuffed intestines; mahshi, anything that is stuffed), Eng. 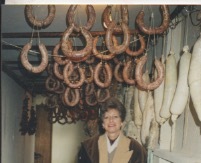 sausages, salted meat. The Spanish word is derived from the Latin salsio, to salt. The Berbers claim they introduced them into Spain long before the hot dog was invented in Frankfurt. The Romans, however, could have introduced them as they ate sausages. Apicius gives recipes for sweet or strong sausages. Recipes for Spanish sausages have varied little over the centuries consisting of chopped lean or fatty pork of pig. Today, Spanish sausages are seasoned with white pepper, paprika, nutmeg with salt and local variations such as basil, sugar, garlic, coriander and/or cumin. In the Middle Ages, Spanish sausages contained minced meat mixed with garum, pepper, coriander, lavender and cinnamon as seen in the Anón Al-Andalus recipe for “mirkas.” Hispano Muslim and Jewish sausages were made with lamb or other meats except pork. 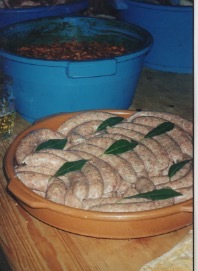 Spanish Christians in general made pork sausages but Anón/Grewe provides recipes using fowl, lamb and goat. Medieval Jews and Christians added wine before stuffing the mass in intestines. Sausages include chorizo (red pork sausage), longaniza (white sausage), morcilla (blood sausage) and salchicha (spiced sausage, in which ingredients vary according to the place where it is made). Of these there are various types: raw, bland and hard and regional variations. Sausages can be cured or smoked to last for a long time without having to be refrigerated. Formerly, as today, sausages are hung or preserved in ceramic jars. 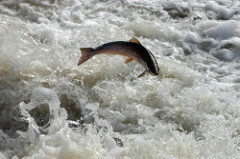 They can be boiled, fried or eaten raw. For a recipe for sausages by the Medieval Spanish Chef see blog titled "picado" published May 29, 2017.